This is for the beer lover in you. You can pick up the hops and explode it with the earthiness of the malt in the beer. Description of Shaving Soap: Van Yulay makes a croap shaving soap, that is neither a cream or a hard puck, but in between. Van Yulay shave soap whips up into a yogurt like, creamy lather in just a few minutes. Formulated with a superior, protective cushion, we make each soap with your skin mind. With that said, we incorporate quality, vitamin enriched, oils and butters, chosen specifically to hydrate your skin. “Leaving your skin better than when we first met.” Notice: These shave soaps are soft and heat-sensitive. Please keep this in mind, should you live in an extremely hot climate, with regards to product shipment. 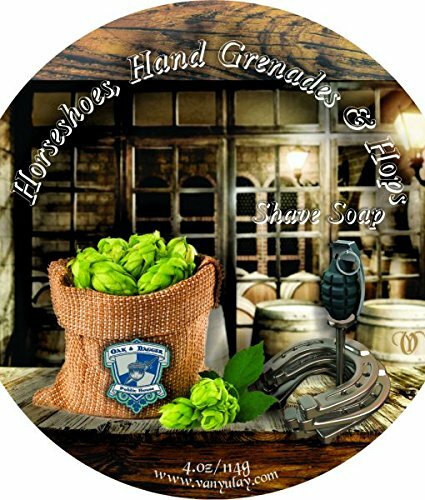 This entry was posted in Shaving Creams, Lotions & Soaps and tagged Grenades, Hand, Hops, Horseshoe, Moisturizing, Natural, Nourishing, Shaving, Soap, Women.